Cyclo catalogs I was recently looking through. Interesting to see offering an 8 speed bicycle in 1934, and it took Schwinn to mass market an 8 speed bike until 1960 with the Schwinn Varsity. I guess the American market was inundated with heavy single speed bicycles that looked like motorcycles and rode like tanks. 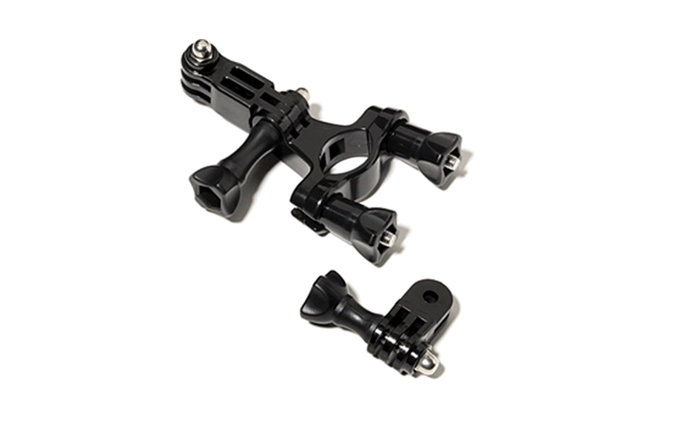 This Rosa pedal extension looks like a great item for riders with wide feet. I don't think I have ever found a pair on pedals before?? 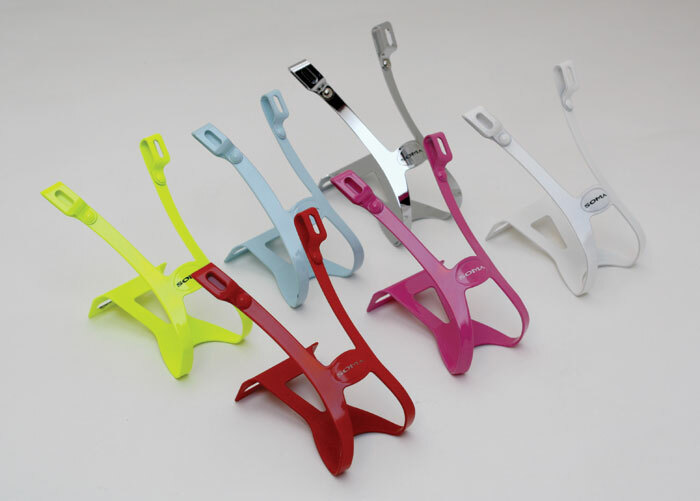 Cyclo Oppy toe clips. named after Sir Hubert Opperman, these wire toeclips were light and inventive solutions. Soma recently produced their version of them- HERE. A handlebar camera mount, I assumed for when not currently riding. 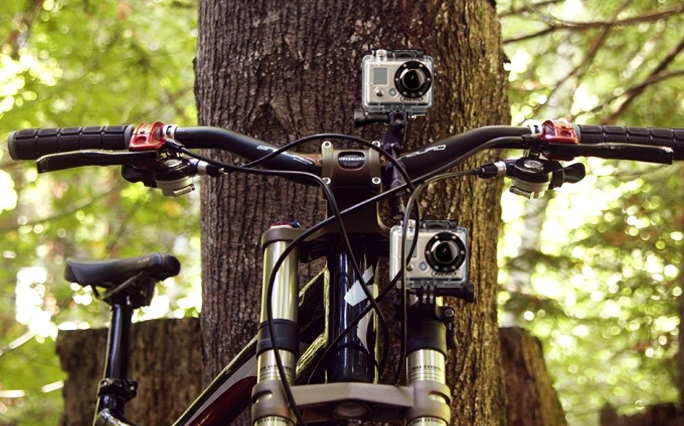 GoPro currently makes a mount to attach a camera to your handlebars as well, but this is for when riding, to record your ride. Rosa rim truer. Does any reader have experience with this tool? Cyclo Rosa rim truer. Efficient and simple. I would love to try them out on some of the old Raleigh Tourist rims. Anyone use them before? Cyclo Benelux tools for adjusting and setting up the cantankerous rear derailleur. Now this is just a wacky design, I don't understand how the turning of the block face will give better braking power when the rubber is worn down? I have never seen on a bike, maybe that speaks to it's effectiveness. Yes, complete with bent fork, and bent rear triangle. 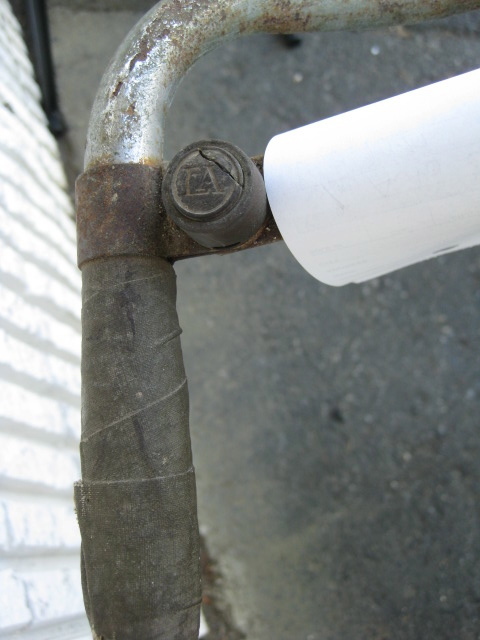 To the casual observer, this is just a rusty ol' bike. To a balloon tire bicycle or Schwinn collector, this is an amazing "barn fresh" bike. Barn fresh is a term used in the collector world that means it has recently surfaced from where ever it has been for the last 75 years or so, untouched by a restorer or collector. Sold, before we got there. Yes, we were late.. . .
Beautiful fender bomb with green reflector. Reflectors are attached to both sides of the hanging tank. Interior of the speedometer. seen better days. "Pogo" seat- it is a sprung saddle, that gives a pogo effect when riding. Tank opens from this side to store batteries, tools, baseball cards. 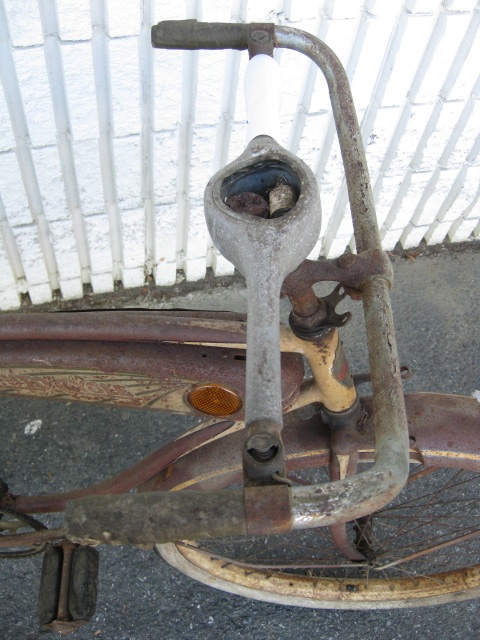 Locking fork, complete with key. Hole in chainstay from the crankarm rubbing while riding. 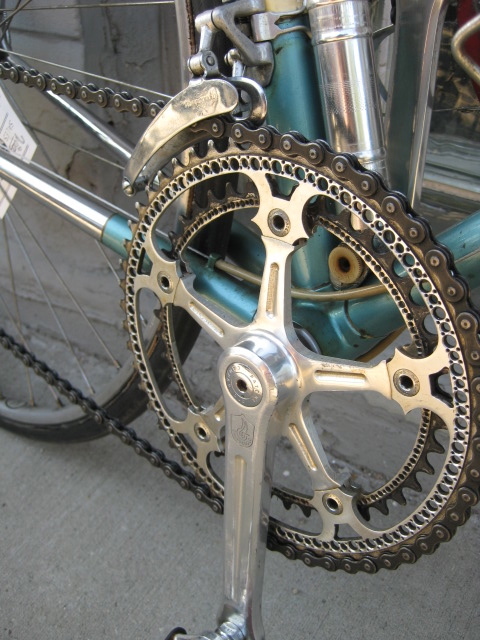 The crank arm is not bent, it is the rear triangle of the frame that is out of alignment. I guess 'junior' didn't hear that clicking noise every crank rotation. 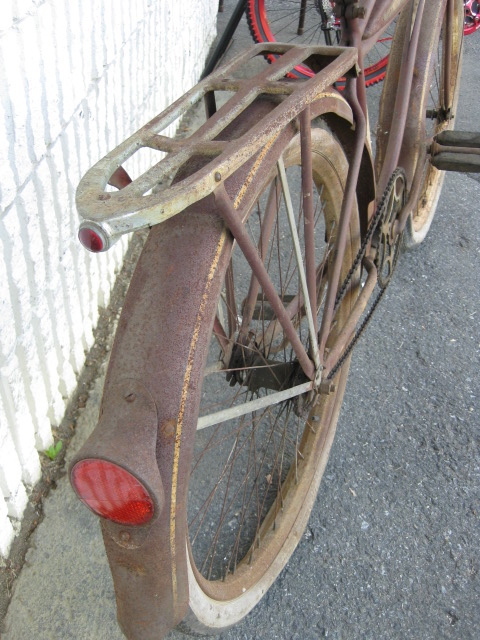 Notice the Miller kickstand, this was before Schwinn welded their patented kickstands on their frames. __It happens. Sure it is scary and horrific, but it is aluminum that is 30 years old, and sometimes we forget we are riding on vintage stuff. I have a lot of parts on my bikes that were made before I was born, some were even manufactured before my father was born. It is good to inspect your components every once and a while. Make it a routine to clean your bike and make sure no hairline cracks or other defects developed. You will be left with assurance your parts are good and you will have a clean bike! early 1970s Cinelli. repaint, after a cracked bottom bracket was repaired. A rack of bicycles at the lunch stop. The Hill Cycle I rode, a beautiful wood rim restored Umberto Dei track bike, a fixed gear converted Scapin, and a mid to late 1960s Carlton. Rack 2- Peugeot PX-10 converted to a fixed gear with early Schwinn Paramount hubs and fork truss support. Chrome Maino fixed gear. Blue Trek 610 and then a Rivendell Bleriot 650b bike. Jed, one of the 2 ride organizers rode this stunning Carlton. The early Umberto Dei. Beautiful bike, and pretty fast rider as well! 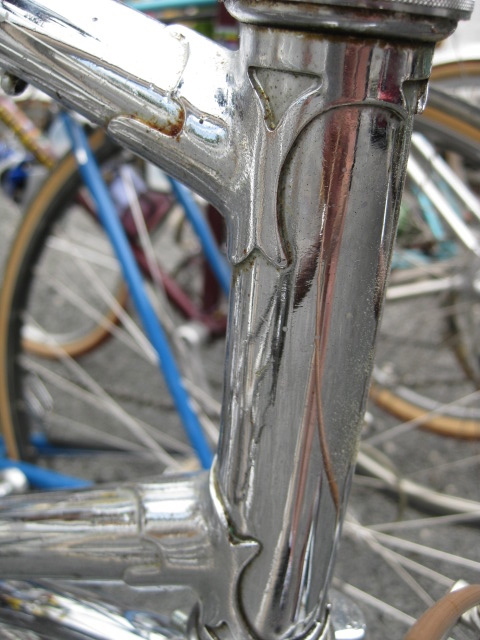 Chrome headlugs on the Maino, Italian built bike. Seat cluster treatment on the Maino. Front brake on the Dei, notice the cork brake pads for the wood rims. British bikes stick together. 1970s Mercian and Raleigh Lenton Grand Prix- Reg Harris model. Curtis and I were dressed in all wool, knit gloves, old Detto cleated shoes and toe-clips and straps.I even wrapped an extra spare tubular tire around my shoulders in case of a puncture. 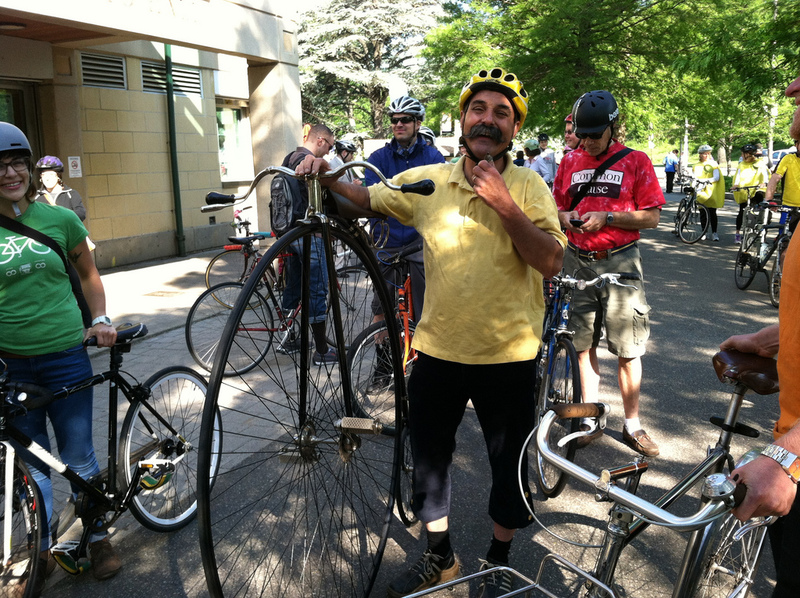 The 100 ride was fun and spirited and thanks to Jed and Mel Kornbluh for organizing it. I look for more in the future. 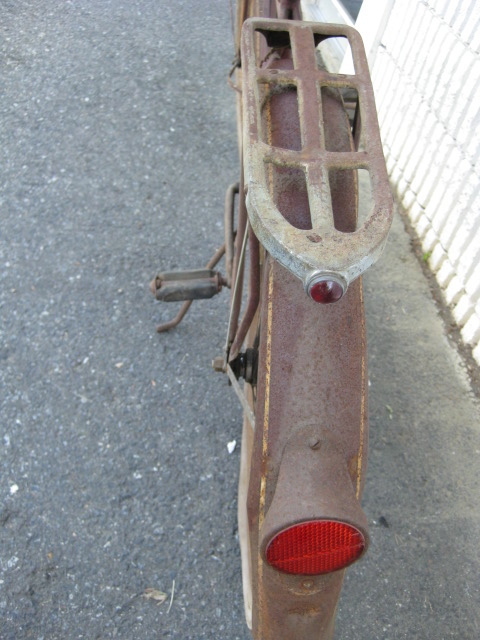 I ride this early 1970s Hill Cycle bike originally owned by the Casale family, and now in possession of the our shop. The Brooks saddle has been "hot-rodded"- a service where the leather top is taken off, the craddle plate is reshaped, and the leather is trimmed and reattached. I will post more pictures of the saddle in the future, with a comparison to an untouched Brooks Professional of that time period. Hill Cycle Shop offered that service along with drilling and milling, I have the catalog mockup somewhere with photographs and prices. Ottusi was the famous Italian who modified saddles. 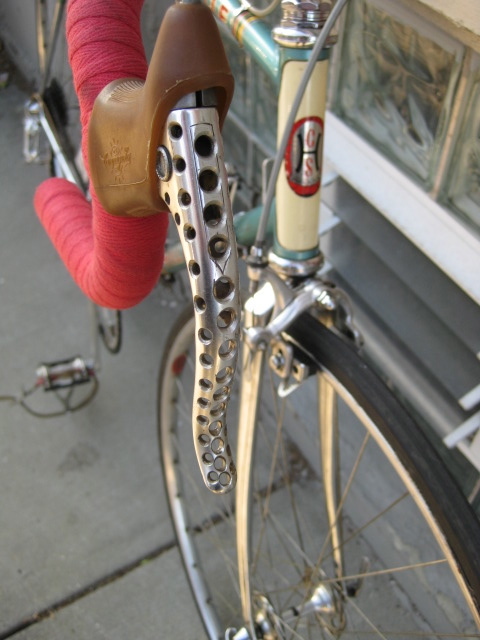 Check out some amazing drillium from an older blog post of mine, including an Ottusi bike, owned by Ken Denny. 1970s Drillium at it's best. Drillium was the milling and drilling of components with the idea of making them lighter and leaving just the bare minimum of material available to have a fast lightweight bike. 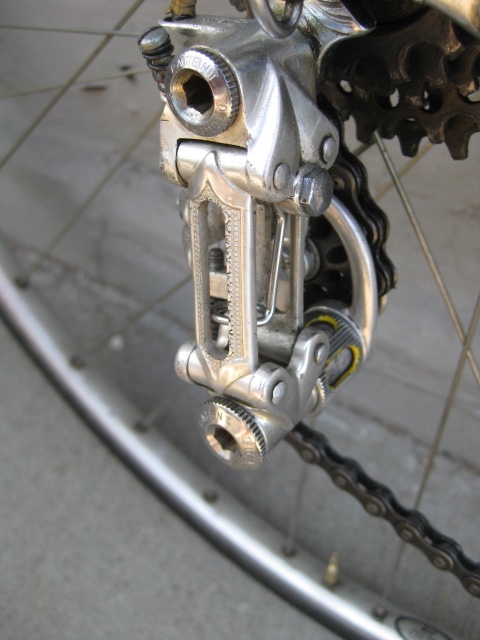 Shifting with these lightened Campagnolo levers were very delicate. Seems some people ride an 1886 bike to work here in Philadelphia. Yes, my watch does match my shirt, thanks for noticing. The bell on my chrome French bike? Ad-Hoc, of course! Thanks to the Bicycle Coalition of Philadelphia for putting this together and Mayor Michael Nutter for once again being apart of it, and supporting bicycles and commuting! If you live in Philadelphia, and commute by bicycle, or ride in Philly, I strongly urge you to be a member of the Bicycle Coalition. It is a nominal fee and you support a cause that is worthwhile, and needed. This “classic inspired” ride will travel from the bustling center of Gloucester County to the bucolic farm roads of Salem County, stopping at New Dodges Market in Elmer for a catered lunch. This is a fully supported ride, but riders are expected to look after themselves. Route map and cue sheets will be provided prior to the event. Additional lunch tickets can be purchased for $10 per person. Have your family meet us at Dodges! New Departure Controller coaster brake hub. This is an early one, notice the brake arm on the driveside(no cog affixed in the photo). It is also takes straight-pull(or sometimes referred to as button head) spokes. 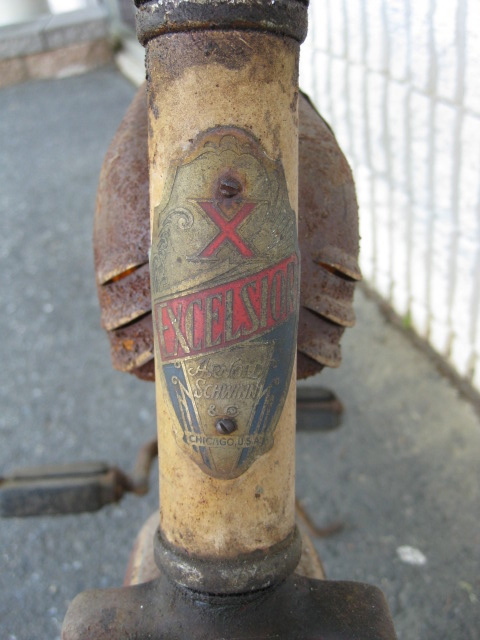 New Departure began in 1888 producing doorbells and by 1898, they produced their first bicycle coaster brake hub. They later were purchased by General Motors in 1916. 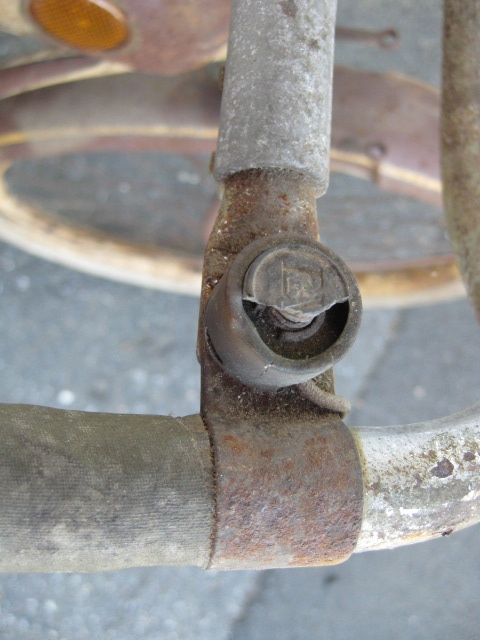 New Departure hubs, the later model D hubs particularity, were known for their great modulation in braking and were found on popular Schwinn Phantoms bicycles.